Home / Fire / Opinion / When will the Fire Stop / When Will The Fire Stop? When Will The Fire Stop? Thanks to JC Groves for capturing this great photo of the fire! 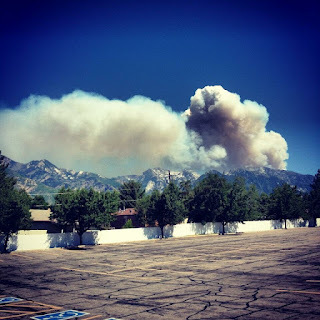 Whenever I see a wildfire in the mountains near my city I am grieved. I hate to see the mountains that I love to hike, climb, and ski destroyed by fire. Recently, we had a very severe, fast moving fire that destroyed thousands of acres within two days. The fire was located in one of the more beautiful areas of the mountain range near my home. This fire started as a wisp of smoke on the horizon and within two hours the plume of smoke had grown so large that one of the mountains could have been mistaken for a fuming volcano. Different video footage of the fire showed a raging inferno, visible even in the day. Every time I have seen a giant plume of smoke coming from a wildfire, I am primarily reminded of the Biblical picture of destruction by fire. Fire is a powerful image that is used throughout the Bible and many times in relation to God. In Genesis 3:24 there is a flaming sword that one of the Cherubim uses to guard the Garden of Eden from re-entrance. In Genesis 15:17 a flaming torch passes through the pieces of sacrificed flesh as God makes His covenant with Abram. In the Exodus, a pillar of fire led the Israelites by night (Exodus 13:21), showing God’s nightly guiding presence. Prophets like Jeremiah and Ezekiel describe the conviction of the Lord as fire in their bones (Lamentations 1:13), and the Word of God being like fire (Jeremiah 23:29). God consumes the sacrifices on the altar with fire in Elijah’s showdown with the prophets of Baal. And finally, in Acts 2:1-4, tongues of fire fall on the disciples on the day of Pentecost showing the inward filling of the Holy Spirit. But fire also represents God’s wrath and is an integral part of the coming judgment of the earth. This imagery can be seen in multiple passages like Numbers 11:1-4 where some of the Israelites are consumed by fire for complaining against the Lord. While there are numerous passages describing God’s wrath as fire, I want to focus on Genesis 19:23-28. This passage becomes the primary pattern for Biblical destruction by fire and records the annihilation of Sodom and Gomorrah when fire falls out of heaven. Abraham looks toward the valley where these two cities were and sees a plume of smoke much like I saw recently in near my own city when the mountains were on fire. When I see a plume of smoke generated from a raging forest fire I cannot help think of the destruction of Sodom and Gomorrah. This imagery is powerful and sticks in my mind as I wait for the coming fire that will be much more intense, a fire that will consume everything when God’s judgment comes on the earth. As I have mentioned, the destruction of Sodom and Gomorrah presents an important pattern of the coming destruction that God has promised to bring upon the world after Christ returns. Revelation 18:9-10 records a similar scene, a plume of smoke from the destruction of Babylon. The world and her riches have been consumed in fire and many people on the earth will lament Babylon’s destruction. 2 Peter 3:10 says the day of the Lord will come and everything we know, the heavens, the earth, and every element will be destroyed with heat and fire, all being burned up. This is depressing imagery. Just as I hate to see the mountains I love destroyed, so also those who love the things of this world will hate to see it destroyed by fire when God returns. The plume of smoke in my mountains reminded me to check my priorities and allegiances in this life. Will I be the one mourning when God returns because I have placed my hope in the things and people of this world? Or will I be cheering God on as he once and for all puts down the old rebellion led by the serpent? Finally, Isaiah 66:24 gives us a parting picture of the eternality of God’s fire. It says, “Then they will go forth and look on the corpses of the men who have transgressed against Me, for their worm will not die and their fire will not be quenched; and they will be an abhorrence to all mankind.” When I see a plume of smoke ultimately I think of this eternal fire as the backdrop to those redeemed and living in the New Jerusalem. God’s salvation set against the backdrop of His judgment. When will the fire stop? Never.